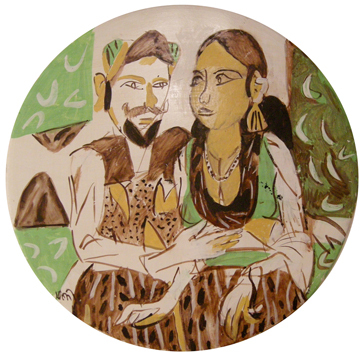 Painter, sculptor, muralist, K G Subramanyan was born in a village in north Kerala in 1924. While studying economics at Presidency College, Madras, Subramanyan became involved in the freedom struggle. He was imprisoned and debarred from government colleges. The turning point of his life came when he joined Kala Bhavan at Visva Bharati in Santiniketan in 1944. He studied at Kala Bhavan till 1948. 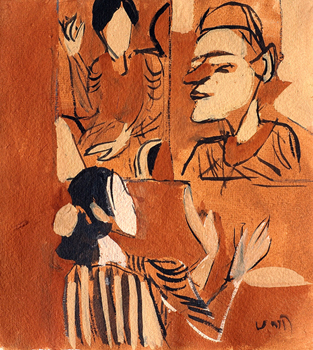 Between 1951 and 1959, Subramanyan was a lecturer in painting at the Faculty of Fine Arts in Baroda. During 1955 and 1956, he went to the Slade School of Art in London to study as a British Council research scholar. From 1959 to 1961, Subramanyan was deputy director (design) at All India Handloom Board. Bombay. He continued to be a design consultant till 1966. He went back to Baroda as reader in painting between 1961 and 1965.From 1966 to 1980; Subramanyan was professor of painting at Baroda. He went to New York as J D Rockefeller 111 fellow during 1966 and 1967. From 1968 to 1974, he acted as the dean of the faculty of fine arts, Baroda. In 1975 and 1976, he attended World Craft council meets as a delegate. In 1976, he was a visiting lecturer at various Canadian universities. In 1980 Subramanyan moved back to Santiniketan and till 1989 was professor of painting at Kala Bhavan. During 1987 and 1988 ' he lived at Oxford as Christensen Fellow in St. Catherine's College. In 1989, he was appointed professor emeritus at Kala Bhavan, Visva Bharati. 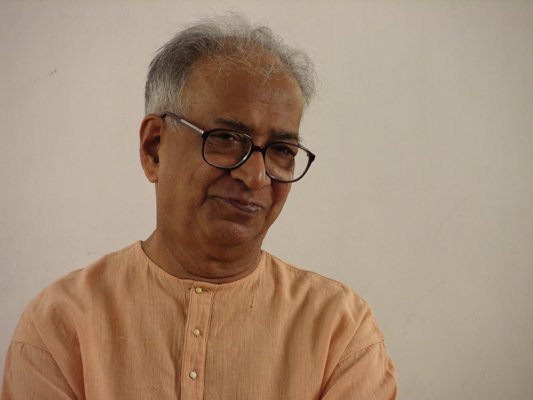 A theoretician and art historian, Subramanyan has written extensively on Indian art. His writings have formed a foundation for the study of contemporary Indian art. He has also written some delightful fables for children and illustrated them.A man of multifaceted talents, Subramanyan demolished banners between artist and artisan. He experimented with weaving and toy making. He also reinvested several mediums earlier used in Indian art. 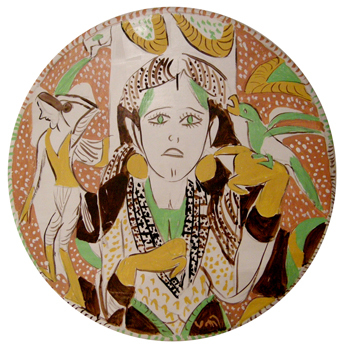 For example, the terracotta mural and glass painting found a new lease of life with his experiments.The artist gave the human figure a new dimension. Drawing upon the rich resources of myth, memory and tradition, Subramanyan tempers romanticism with wit and eroticism. He has received the Kalidas Samman in 198 1, the Padma Shree in 1975, a D. Litt. (Honoris Causa) from the Rabindra Bharati University, Calcutta in 1992 and became a Fellow of Kerala Lalit Kala Akademi in 1993. K.G. Subramanyan is a major presence on the Indian art scene. 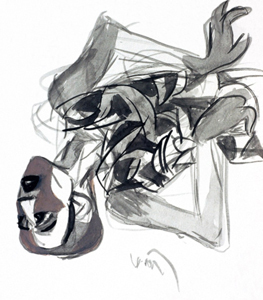 His flexibility of expression and richness of visual language evolve from the diverse materials he works with as painter, muralist, printmaker, relief-sculptor and designer. In his recent work Subramanyan uses many registers of language to slide from high seriousness to irony, celebration to subversion, descriptive rendering to lyrical evocation, fact to metaphor, and from real to surreal with the ingenuity of a consummate craftsman and the alertness of a nimble thinker. The book “The Painted platters” by Professor R. Siva Kumar, published by The Guild, takes us on a special journey into K.G. Subramanyan’s series of work called saras (a genre of ritualistic art within Bengal’s folk art), documenting and celebrating them.